New There are 12 products. 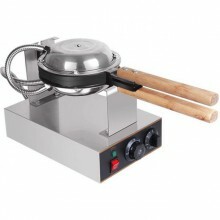 Counter top 'Bubble Waffle" maker ideal for domestic or commercial use. Teflon coated cast iron plates. Brand new item, boxed, made in China. Price without VAT. 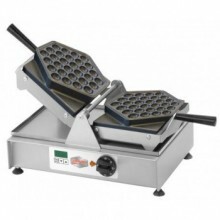 Traditional belgian Waffle maker, ideal for gastro or commercial use. Stainless steel basement with cast iron baking plates. Brand new item, boxed, made in EU. Price without VAT. 'Neumarker' counter top 'Waffle coin' maker, model Eco, recommended for gastro and commercial use. Stainless steel casing with fixed, uncoated cast iron baking plates, height-adjustable feet. Brand new item, boxed, made in Germany. Price without VAT. 'Neumarker' counter top 'X-Waffle sandwich' maker, model Eco, recommended for gastro and commercial use. Stainless steel casing with fixed, uncoated cast iron baking plates, height-adjustable feet. Brand new item, boxed, made in Germany. Price without VAT. 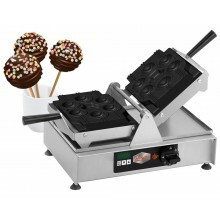 'Neumarker' counter top 'Dony Donut waffle' maker, Eco-model, recommended for gastro and commercial use. Stainless steel casing with non-stick coated aluminium fixed baking plates, height-adjustable feet. Brand new item, boxed, made in Germany. Price without VAT. 'Neumarker' counter top 'Butterfly on a stick Waffle" maker recommended for gastro and commercial use. Stainless steel casing with fixed, uncoated cast iron baking plates, digital timer, height-adjustable feet. Brand new item, boxed, made in Germany. Price without VAT. 'Neumarker' counter top 'Twist Pop Waffle" maker recommended for gastro and commercial use. Stainless steel casing with non-stick coated aluminium fixed baking plates, optimal dough distribution due to baking plates left-right pivoting, digital timer, drip tray, height-adjustable feet. Brand new item, boxed, made in Germany. Price without VAT. 'Neumarker' counter top 'Bubble Waffle" maker recommended for gastro and commercial use. Stainless steel casing with non-stick coated aluminium fixed baking plates, optimal dough distribution due to baking plates left-right pivoting, digital timer, drip tray, height-adjustable feet. Brand new item, boxed, made in Germany. Price without VAT. 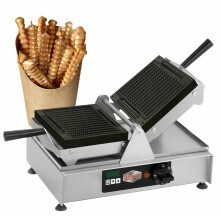 'Neumarker' counter top 'Waffle Fries" maker recommended for gastro and commercial use. Stainless steel casing with non-stick coated aluminium fixed baking plates, optimal dough distribution due to baking plates left-right pivoting, digital timer, drip tray, height-adjustable feet. Brand new item, boxed, made in Germany. Price without VAT.